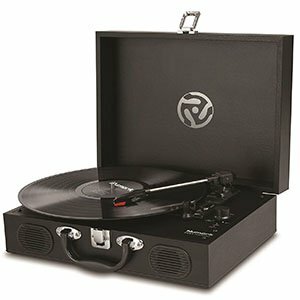 One of the greatest misconceptions about turntables in general, is that you have to get a $300 model if you want to enjoy listening to records. This is simply not true. 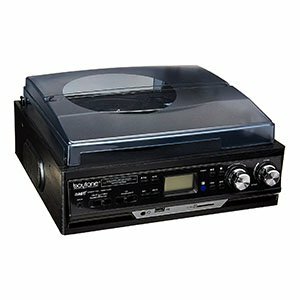 Today we are going to show you some of the cheapest models out there, which are deemed the best turntables on the market to start out with. Going with any of these will get you a great balance of price and performance, which will allow you to learn the ropes of using this tech. Later on, we’ll talk a bit about affordable turntables and what to look out for. A very compact, portable, and lightweight design. Puts out a good amount of volume for its size. Vinyl to MP3 recording is a really useful feature to have. Not much in the way of bass response. 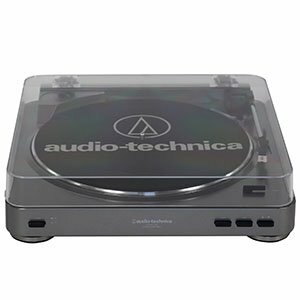 When it comes to entry level turntables, you do not usually expect to receive a whole lot of features beyond the simple fact that the device will play records for you. 1byone have bucked this trend entirely, and with killer features like vinyl to MP3 recording, this device has a whole lot to offer that you may not find elsewhere. ​We found the bass response was a little lacking during playback, and while this is fairly normal at this price range it is worth keeping in mind that you aren’t going to get a whole lot of power in the low end if you opt for 1byone’s offering. Other than that, this is a great choice for the entry level consumer. An extremely compact design that is easy to transport. Several color variations on offer. Lots of features you wouldn’t normally find at this price point. Native audio is lacking, but can be extended through RCA output. Jensen have done a great job of packing in a whole bunch of features that you wouldn’t normally find in a turntable of this price range. This has raised the bar for entry level turntables to up their game in terms of offerings. Whilst the native audio isn’t fantastic, it is easy to extend by plugging in your own speakers. ​It may be disappointing for some who are fans of the plug and play element of low end turntables that speakers are pretty much required if you want to get a good listening experience out of them, but this is the price you pay to, you know, not pay that much of a price! A decent choice for the price range. A reliable and trusted brand name at a fantastic price. As simplistic and easy to use as turntables will get. An aluminum platter is a welcome upgrade for a budget device. Non-adjustable tone arm will be a deal breaker for some. It's not the most feature-packed turntable out there. The LP60 is a beautifully-designed turntable for the everyday music lover and first-time buyer looking for quality at a low cost. It offers great value, awesome looks, and is both simple to set-up and use. However, if you’re looking for something to get creative with, there are much better options for you to consider in this price bracket. ​The fact that you can not adjust the tone arm will put some people off who prefer more control over their playback experience. Similarly, there is an overall lack of additional features which may, again, be enough to switch some potential consumers off this model and towards something more flashy. But if sound quality is your primary concern, this is a fantastic and safe choice from a trusted brand. A great looking, customizable design with many color options. Lots of options when it comes to portability. Sound quality is decent for the price. Bass response is lacking for the most part. With the Vintage 3-Speed, Victrola have managed to create a perfect entry level product for someone who cares about both performance and aesthetic. The device itself is quite something to behold, and with the sheer variety of color combinations on offer, you’re sure to find something that fits your stringent requirements. Sound quality is good, though bass is lacking. ​The portability of this device can not be overstated, and the suitcase design has rarely been as well realised as it is in the Vintage 3-Speed. 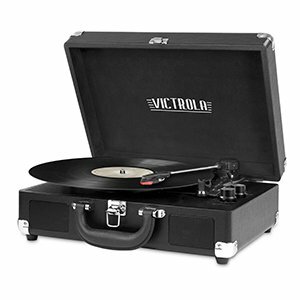 Victrola have done well to cram a lot of tech into a small, lightweight package, and this will be welcome news to anyone who intends to travel with their turntable a lot. A strong option. Stylish with a unique design that’s hard not to like. Packed full of features that are hard to come by at this price. USB charging and a 4-hour battery life for on-the-go use. There's no USB power brick included for charging the battery. It's not the best build and doesn't have great sound quality. Stylish and compact, with features and connections galore, the Numark PT01 Touring is a unique and very cool portable turntable at a great price. But it’s far from perfect. What you gain in portability and features you lose in sound quality and build. There’s still a lot to like about this turntable, but it’s not likely to be for everyone. ​It is a shame that no USB power brick is included so as to charge the battery, but the very fact that you can charge the device for up to four hours of playback is a pretty great feature nonetheless, and purchasing a USB power brick will not set you back a huge amount in the grand scheme of things. One of the best looking portable turntables I’ve seen. Fully featured with plenty connectivity options for the casual user. A bargain, you get a lot for your money here. You sadly have to sacrifice great sound for a great design. Stunning design and a decent set of features. As portable turntables go, you’re going to be hard-pressed to find one nicer-looking than the Executive for this price. If you need exceptional sound quality, it may be better to look elsewhere, but for the casual listener after a good-value record player, this will do just fine. ​As you might expect from the delightful form factor, most of the thought and time of this device has gone into making it look good. Certainly more resources have been devoted to its look than have been made to ensure that it sounds as good as it could, and even at the entry level price range other turntables outperform its listening experience in a noticeable way. Pretty portable thanks to its suitcase design. Solid versatility in terms of onboard features and options. More than acceptable performance for beginners and casual users. Complete lack of upgrade paths of any kind. 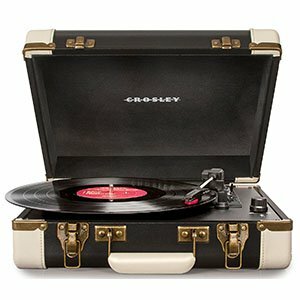 Crosley CR6019A-BK is among the most popular affordable choices on the market. It is simple and rich with features at the same time. The type of performance you can expect is mediocre, but there isn’t much more we could expect at this price range. If you just want something to occasionally play some records, this is a decent solution. 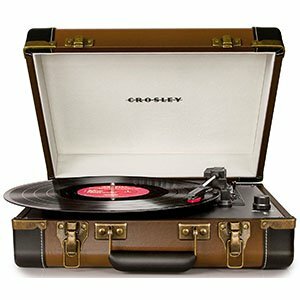 ​This is a really good looking turntable, like most of what Crosley puts out, and a lot of attention has gone into ensuring that it both looks good and is optimally portable. These are both welcome features, and are complemented by a sound quality that is thoroughly adequate for this affordable price range. A very good option for the turntable newbie. Extended versatility with lots of features and options. Decent enough performance across the board. A tad bit too bulky for our taste. Boytone BT-17DJB is a jack of all trades, there’s no other way to put it. The level of performance it offers is on the same level with the most of its competition, however, it’s far more versatile than most. One of the several downsides to owning one of these is the fact that it doesn’t really look like a turntable. 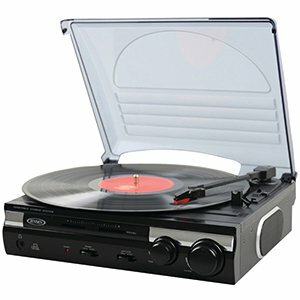 Record players found in this price range are going to be the most basic ones you can get. By basic, we mean all-integrated components and very little room given for upgrades. For someone who is just getting into the hobby, that is about exactly what you want. As you gain experience and learn about turntables, you will find out why $500 models cost as much as they do. Control is pretty much everything when it comes to vinyls and turntables, but more controls means higher price tag. The only real downside to affordable record players is the fact that you won’t be able to upgrade components. An average turntable is a fairly complex machine that is only as good as its core components. However, this level of integration is the price we have to pay in order to have access to affordable turntables. What matters the most is that a $100 can easily get you a good amount of audio quality. There will be some limitations, but the core performance is still going to be there contrary to what some like to think. 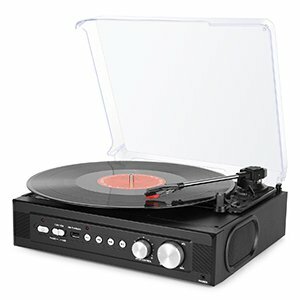 Starting out on a $100 record player is highly recommended to anyone who’s new to this hobby and are looking to learn how this stuff works. Ever since vinyls became popular again, we’ve seen a surge of super cheap turntables hit the market. You will want to stay away from these if possible. Generally, the cheapest you will want to go is right around $70. Anything below that price point will most likely be junk that is either going to eat up your records, or fail on you after a short amount of time. Coincidentally, these models are often times the most attractive looking ones on the market. Someone who is just starting out and didn’t do their research, might fall for this type of marketing. Take any of the models listed above and compare them to your average $50 record player. The gigantic difference in both the specs and general opinions should tell you all you need to know. Getting into turntables will change the way you look at music. The sound you get is going to be more organic and natural sounding compared to just about any digital format out there. Sure, it’s not as easy as just pressing a play button, but good things are always worth the additional effort. Models we’ve shown you above are by far some of the best you can get in this price range. We strongly recommend that you don’t fall for the super cheap ones, as they can easily lead to disappointment. As always, do as much research as you can.